According to the New York State Science Learning Standards, all students, including ELLs, need to “understand and apply scientific concepts, principles, and theories...” (NYS Learning Standards for Math, Science, Technology, 1996, p.1). 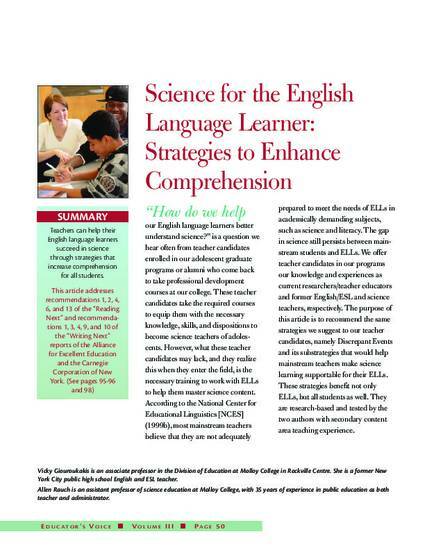 [They] are expected to acquire skills such as discussing, analyzing, reading, and writing in ways similar to those of a practicing scientist” (Medina-Jerez, Clark, Medina, & Ramirez-Marin, 2007, Science for ELL, para. 2). Most students in science, however, have difficulty comprehending science content (Schoenbach et. al., 1999) and are challenged by the specialized terminology in science. Furthermore, students believe that science is a body of knowledge rather than a way to generate new knowledge or solve problems (National Institutes of Health). Therefore, they attempt to memorize new concepts rather than learn to think like scientists.